This issue of Between the Sheets has a new look that we hope will make it simpler and easier to read on your mobile device. Currently over 50% of all emails are opened on mobile devices, and the older format of this newsletter was not really mobile-friendly. If you have comments or feedback on the new format, please click here. Although we are still in the heart of winter, it's time to start planning for summer sailing. One important thing you can do now is to check over your sailing gear. Do those old, worn sailing gloves need replacing? If you have an inflatable life jacket, is your cartridge in the "green zone." Do you have a hat and sun glasses to keep you safe from the ravages of the sun? Remember, our boats are in the water May 1. Do you have a waterproof jacket with a fleece lining that can keep you warm and dry on cold spring days? Don't forget those waterproof pants. They can come in handy when the weather is cool or wet. Remember, cotton clothing takes a long time to dry and can keep you chilly. Nylon clothing dries quickly. Shoes are also important. Many types of athletic shoes can slip on wet decks. Are your soles non-slip and properly grooved for sailing? Plan to attend the Sail Chicago Annual Meeting on Wednesday, March 3. Program heads will outline their plans for the upcoming sailing season, and you'll have a chance to vote for members of the Sail Chicago Board. Remember, you'll need to be a 2016 member in order to vote. Membership registration is now open online (see article below). If you come early, plan to have dinner with other Sail Chicago members at Chief O'Neill's Pub (see article in this issue). And don't forget all the other Sail Chicago activities taking place in march and April. See "Dates to Note" in the left column. Now's the time to renew your Sail Chicago membership! Click here to log into your account. In the "Account Summary" panel on the right, where it says "Non-Member", click "Upgrade/Renew" and follow the instructions. Click here for help. Sail Chicago members and guests are invited to attend our Annual Membership Meeting on Wednesday, March 2nd, at Chief O'Neill's Restaurant & Pub, located at 3471 N. Elston, Chicago. Free street parking is available nearby. The meeting will start promptly at 7:00 pm, but do come early to join friends for a drink or dinner. The meeting will feature the annual "State of Sail Chicago" report by our Board Chairman and program heads, election of Directors for new three-year terms, and a question-and-answer period with the Board. This year, presentations will be streamlined so that there will ample time for discussion and socializing. The anticipated end time of the meeting is 9 pm. We hope you will be able to attend and help us roll out our 2016 sailing season! If you have not renewed your Sail Chicago membership online (see article above), paper membership forms will be at the meeting registration desk. We CANNOT accept credit card payments at the meeting, so remember to bring your checkbook. In order to vote for Board candidates, members MUST be current in 2016. Help get this Colgate ready to sail. Believe it or not it's almost time to start getting our fleet ready for the Spring trip up the river. We've had a very mild winter this year (unless you moved here from Florida), so I'm hoping that we can get out there soon to work on the boats. The spring and fall boat work is not strictly the duty of only the maintenance group, and it's extremely helpful to have other members involved. While it is possible to satisfy your service requirement by helping with spring maintenance, we also need people who just want to stop by for a few hours and get together with other members who are getting ready for the start of the sailing season. We can always find things to do for anyone interested in working in a particular area. For the benefit of our new members, there is not a fixed group of people who manage the process. Each year the maintenance coordinator tries to find a few people who are familiar with a general job group and those people in turn find others who will pitch in each weekend. Members who are experienced in a particular area will instruct others, who then may manage the process the following year. We encourage all members (both new and old) and all skill levels to come out for at least one day of helping to prepare our boats for launch this spring. It's a fun experience and gives you the uplifting feeling that we are going to start sailing soon. As an all-volunteer organization, we depend on your support. If you are interested in learning more about maintenance of our boats, from the Ideals to the Hunter, email me, and I will contact you with updates as we firm up our spring schedule. Sail Chicago once again made its presence felt in a big way at the 2016 Strictly Sail Chicago show, January 14 - January 18, at McCormick Place. The event is the largest of its kind in the Midwest and includes virtually everything a sailor or boat owner needs to know about boats, gear, accessories, where and how to sail, certifications, and more. Hundreds of exhibitors jammed McCormick Place's South Hall to display their wares and discuss the finer points of sailing. Sail Chicago was one of those exhibitors. Almost fifty Sail Chicago members generously donated their time to help staff our booth during the five days of the event. 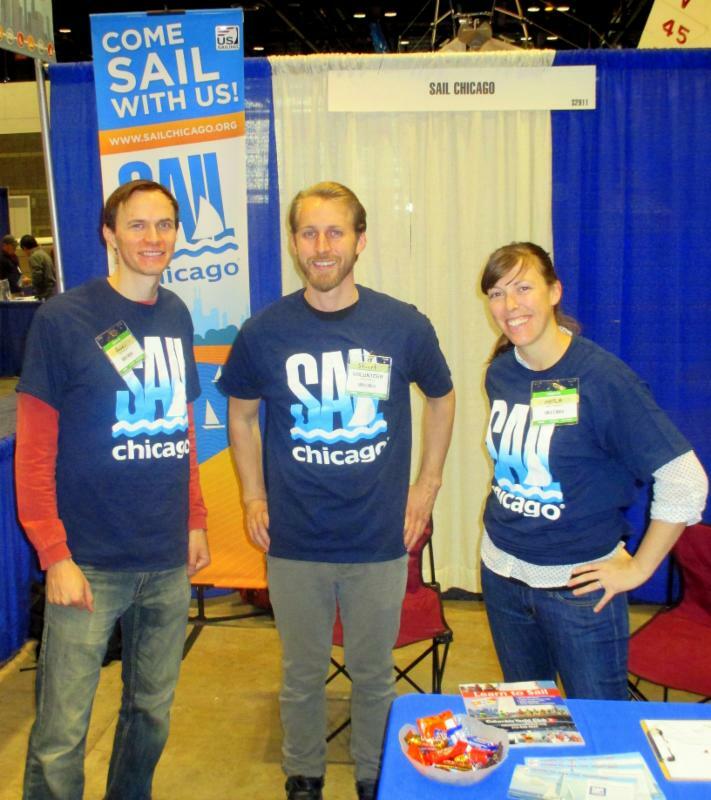 Our motto, "Come Sail with Us," could be heard echoing throughout Festival Hall at Navy Pier during the show as our volunteers, wearing T-shirts emblazoned with the Sail Chicago logo directed show-goers to our booth. These efforts were not unrewarded. Over seventy-five Show visitors signed up to learn more about Sail Chicago's instruction and racing programs, and our New Member Package. 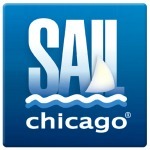 This year also marks the beginning of a new era for Sail Chicago's participation at the Show. U.S. Sailing, the sailing organization with which Sail Chicago has a close affiliation, for the first time sponsored a pavilion at the Show where all its affiliates were located. Our booth faced the U.S. Sailing Pavilion, and we were able to interact with many of the same visitors to the Show. U.S. Sailing has promised to be back again next year, and we will be right there with them. Thanks to all those who helped to make our presence at Strictly Sail Chicago felt in a very positive way. We're grateful for your efforts. FULFILL YOUR SERVICE TIME REQUIREMENT! We are hoping to simplify the way members use our web site to sign up for service time this year. In the meantime, if you have any questions about service time, please contact Christine Garvey . Operations: Someone to answer all email inquiries to our website. This job can be done anywhere you have Internet access. Instruction: 1. Someone to track students, making sure they are progressing properly. 2. Someone to help with curriculum production. 3. Someone to help with registration. 4. Instructors and members interested in becoming instructors. Maintenance: 1. Helpers on all maintenance teams. 2. An assistant maintenance leader. 3. Boat managers. Programs: 1. Someone to help plan parties. 2. Skippers for member cruises, Tiller Time, and community sails. Many hearty thanks to our uber-dedicated Sail Chicago volunteer Instructors who are the backbone and soul of our organization. Many of our Instructors not only teach more than one class, but when we add the multiple make-up sessions they teach, they might find themselves going out eight times for a four session class. Their dedication and passion for passing on the joy of sailing is an inspiration. We look forward to seeing all Instructors at the Spring meeting on Saturday, April 2nd at 10 a.m. (location TBD) and look forward to a great new season! This year's class will be held in the South Loop on the consecutive Saturday mornings of April 9 and 16 from 9 a.m. to 1 p.m. This class is a prerequisite for the Bareboat Cruising course where we sail our Hunter 34 to a foreign port. Watch your inbox for sign-up opportunities soon. 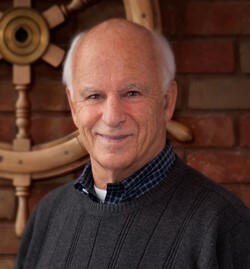 Mark your calendars for the evening of March 9, 6:30 pm at the Columbia Yacht Club and plan to attend a talk by Steve Jackson as he shares his experiences on his ocean-spanning journey aboard the Suzy Wong. It will be an evening you won't soon forget! The "Voyage of the Suzy Wong" is a true-life adventure story about four novice sailors and their dog. They journey in a wooden boat from Hong Kong back home to America, navigating by the stars on their 26,000-mile, epic-making voyage. These young seamen relied on the kindness of strangers, their own resourcefulness, and just plain luck. They managed to avoid pirates, but they didn't escape bouts of seasickness, kidney stones, dysentery, monsoons, equipment failures, swarms of locusts, and even encounters with snakes. A revitalized US Sailing Championship, the International Women's Keelboat Championship (IWKC), is aimed at maximizing opportunities for women sailors to participate in high-caliber regattas against top international sailors. The American Yacht Club in Rye, N.Y. will host the new IWKC J/70s regatta from August 14th to 20th, 2016. The championship will rotate each year to venues within, and outside, the U.S. with the goal of attracting more international teams. Please click here for more information; or email Jake Fish at U.S. Sailing. The names of these candidates, together with the names of any other Sail Chicago members who would like to run for the Board, will be placed on the ballot and voted upon by the entire Sail Chicago membership at the Annual Meeting (see article in this issue of Between the Sheets). If you'd like to find out more about the candidates who are endorsed by the Board, click on each of the names above. If you'd like to have your name placed on the ballot, contact Steve VanderVoort. not inevitably take over as Maintenance Coordinator (unless they really want the job). While the position is primarily administrative, a good deal of knowledge regarding boat maintenance will most likely be picked up. This position satisfies your annual service requirement and may qualify for sailing credits. If interested, please contact Tom Peterson for more information. 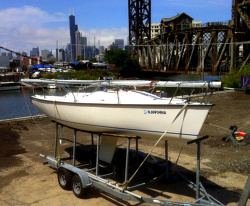 Sail Chicago's cruising boat, Priorities, is getting a major overhaul this winter. The boat's Diesel engine has been removed and is being completely rebuilt by a Diesel engine maintenance company. It will be reinstalled in early spring. 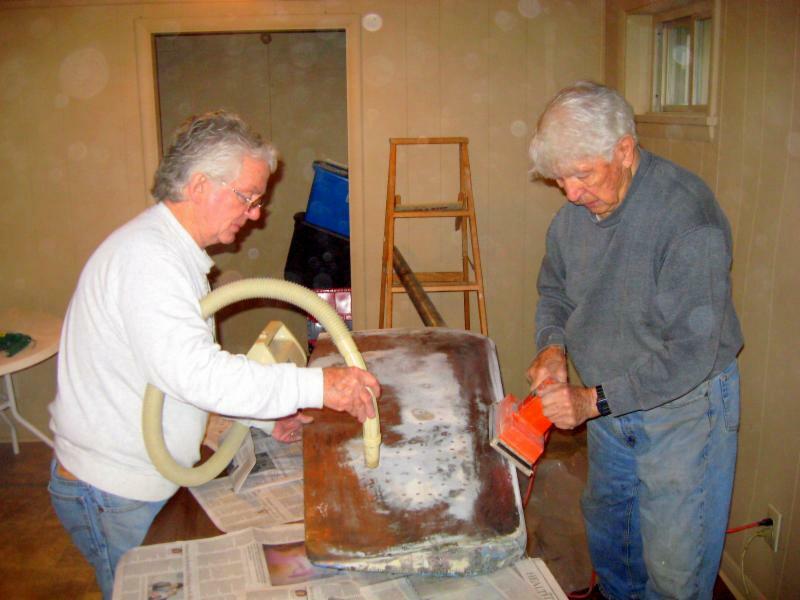 In addition, several of our Sail Chicago volunteers have been busy this winter repairing Priorities' rudder. It's not an easy job, but they have tackled it with gusto a have promised that it will be completely repaired and installed by the start of the sailing season. Our thanks to these intrepid sailors who have dedicated so many hours to insuring that our cruising boat will run smoothly and safely this summer. Registration for classes should open beginning of March. Annual instructors meeting April 2. Looking at chase motor boats to help with maintenance and racing. Working on incentives for instructors. Working on ways to prepare instructors. Board approved getting Priorities repaired.